The Mt. 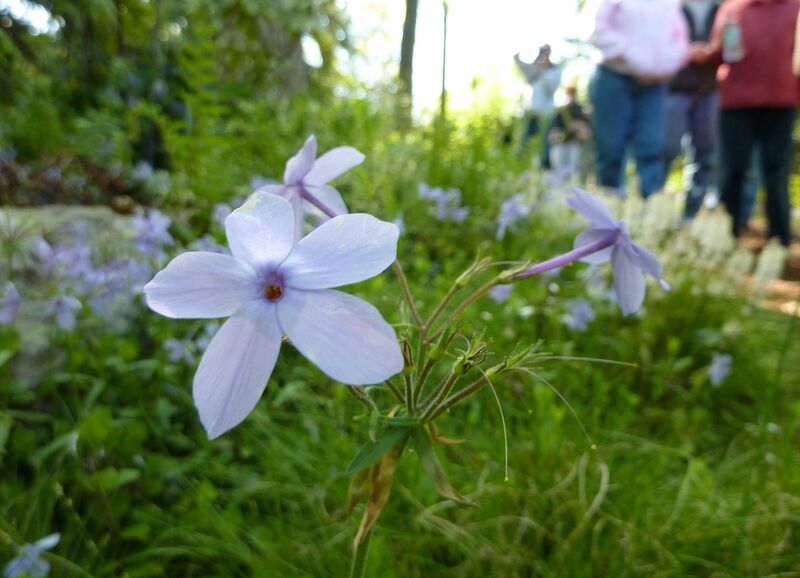 Cuba Center held their 8th Annual Wildflower Festival last week, and I'm thrilled to say I was one of the first ones through the gate. This year was truly one of the best I've ever been to. 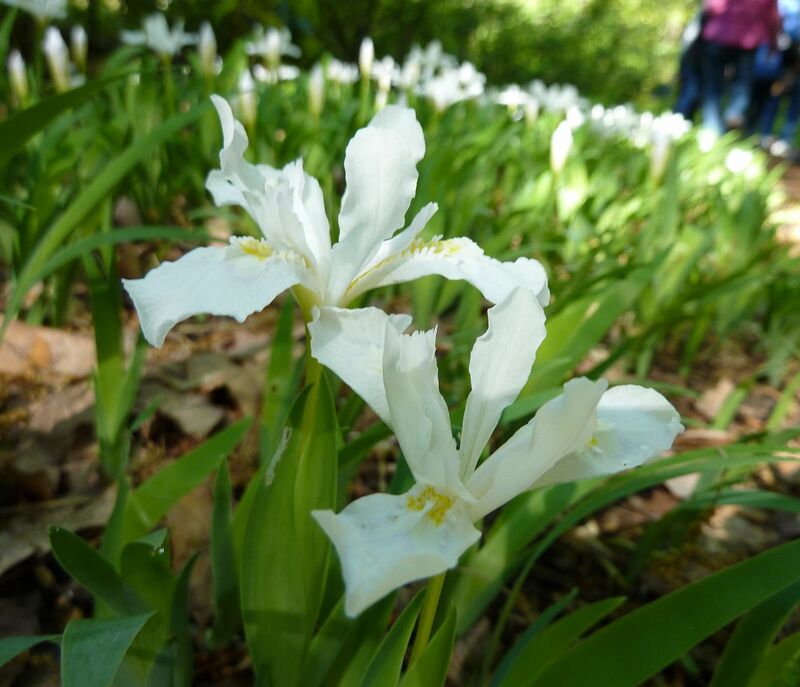 The unusually warm spring has caused lots more plants to flower much sooner than usual, and strangely enough a lot of the plants that normally flower towards the end of April, start of May, were still in flower. 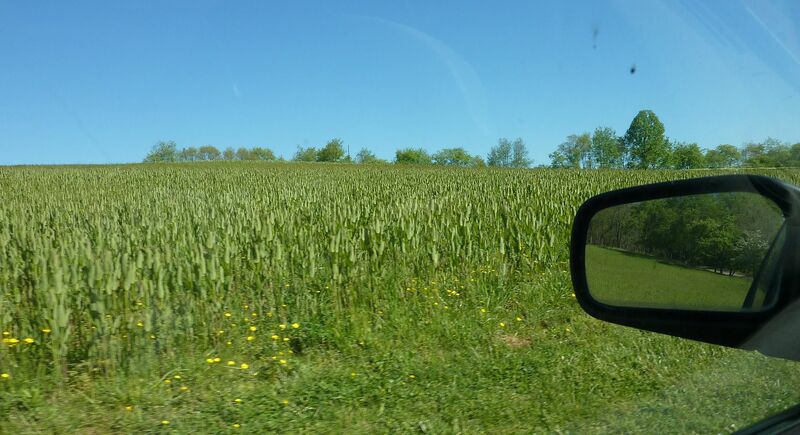 The day began with me pulling into the Red Clay Preserve. I'm not familiar with the place other than knowing it's a large property with lots of meadows which are mowed for parking. The fields are filled with many plants, but most abundant seemed to be some type of Milkweed (The broader leafed stems poking up everywhere). I'm not sure what these fields are used for over the rest of the year but I think they were sprayed with herbicide. While walking to the Mt. Cuba Center I noticed the tips of some plants seemed to be dying back, and at the end of the day it seemed even more of the plants were dying. There was easily 100 people waiting for the gates to be open. The first 500 families/groups received a ticket for a free plant. 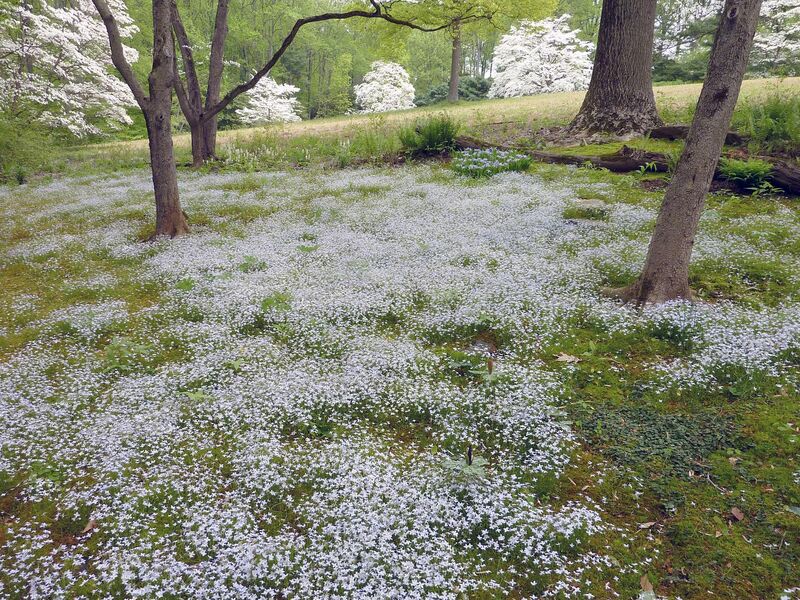 This year they handed out a species of Violet, Viola walteri 'Silver Gem' a cultivar they developed over the years. 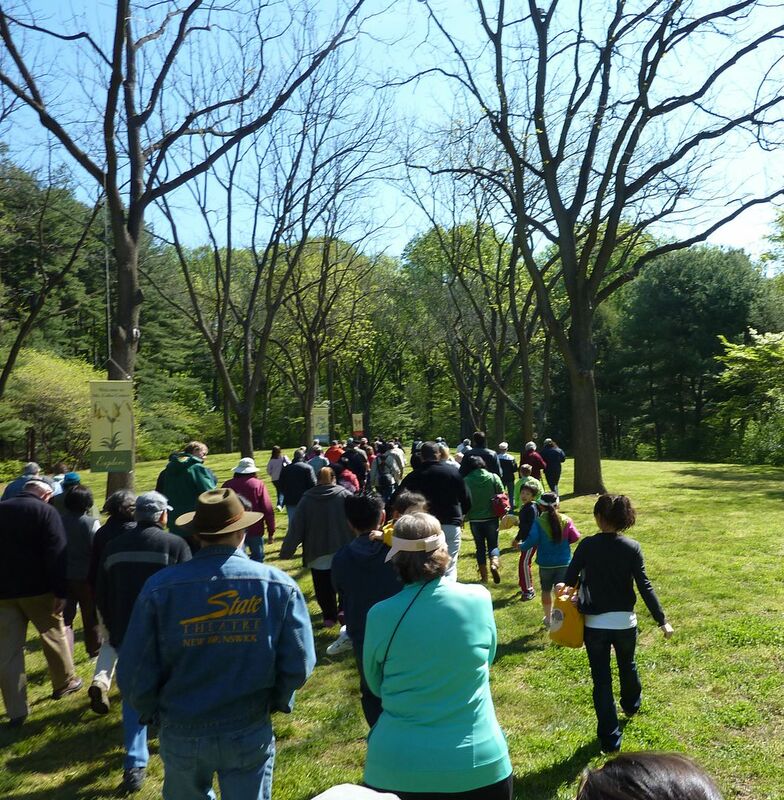 The general crowd was mostly families, garden enthusiasts, photographers, and hikers. I also noticed a fair amount of what I assume are tourists. Every so often you'll hear someone speaking in an accent or other language. So there's a wide variety of people that attend. One thing I found amusing was when one person read the wrong label to the plant above. "Aromatic Aster, well let's give that a smell." I found this funny because any gardener knows that Asters would never be blooming in the spring time. 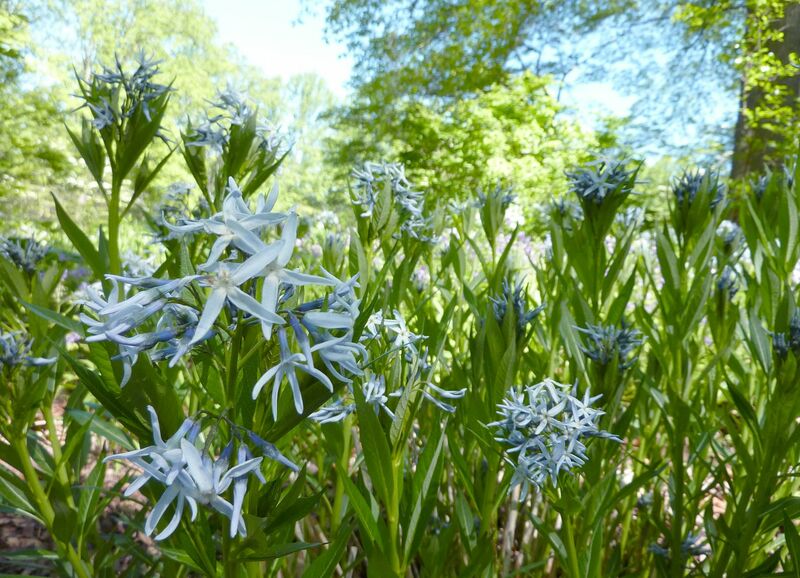 The plant above is actually Camas. This is an example of a plant blooming sooner than it should. Normally they're flowering more towards June. 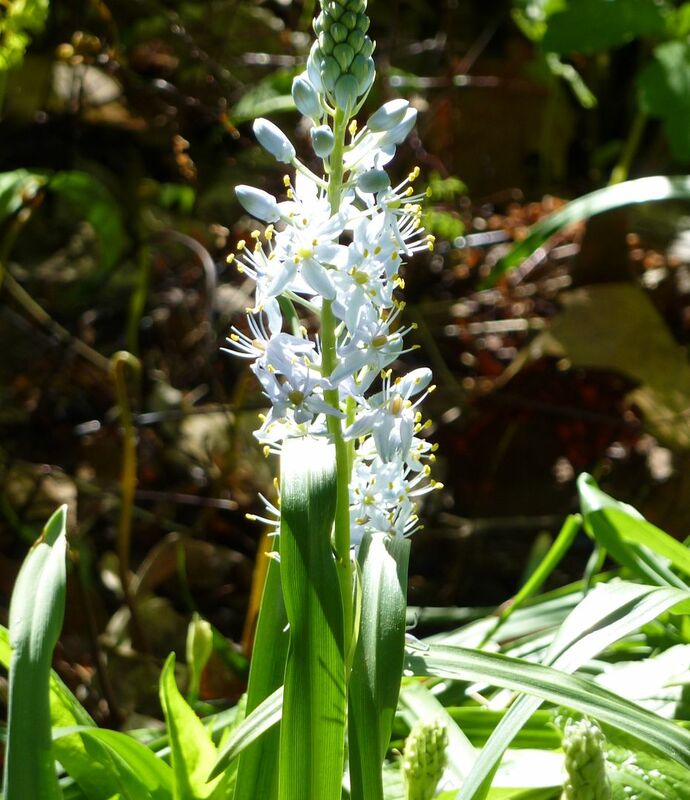 Another thing about this plant though is Prairie Moon Nursery has started selling these plants as Wild Hyacinth. I just think it's weird marketing, because Hyacinths normally have a fragrance, and as the random person demonstrated, this plant does not. The Mt. 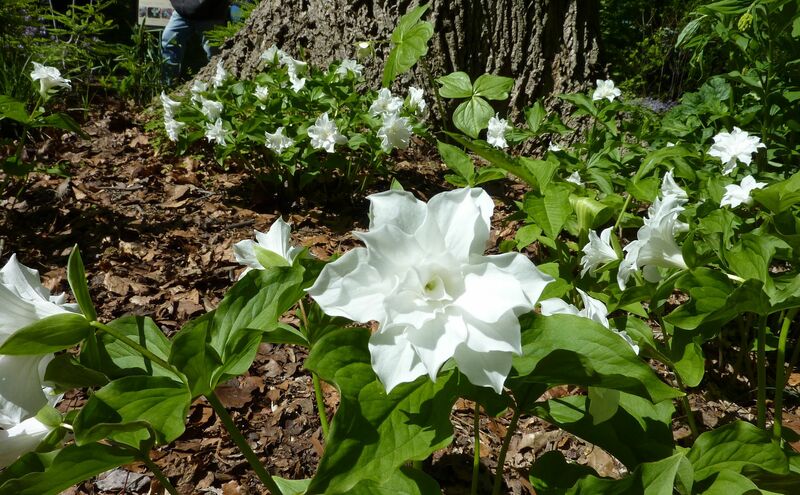 Cuba Center, I believe is one place that has been entrusted with a number of Trillium species. 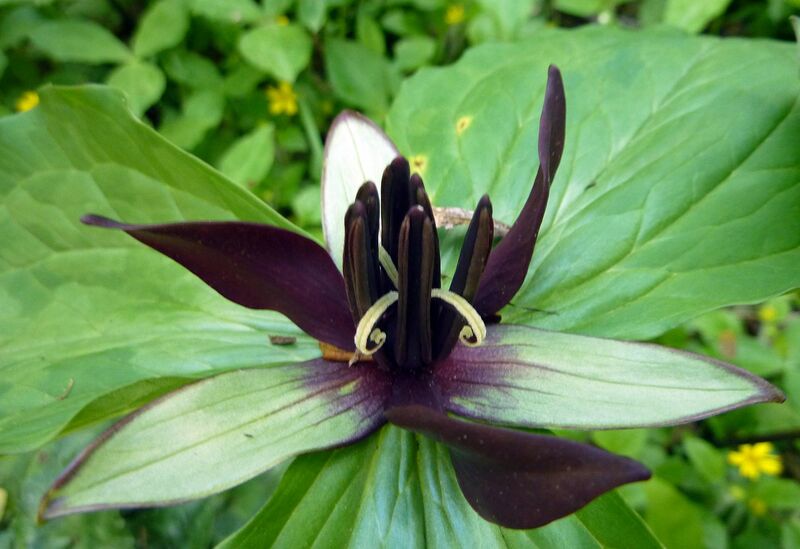 Here I think this is Trillium erectum. It's also a good time to state that the lighting was a little harsh that day so some of my photos have this blown out look to them. This was something of a happy accident. 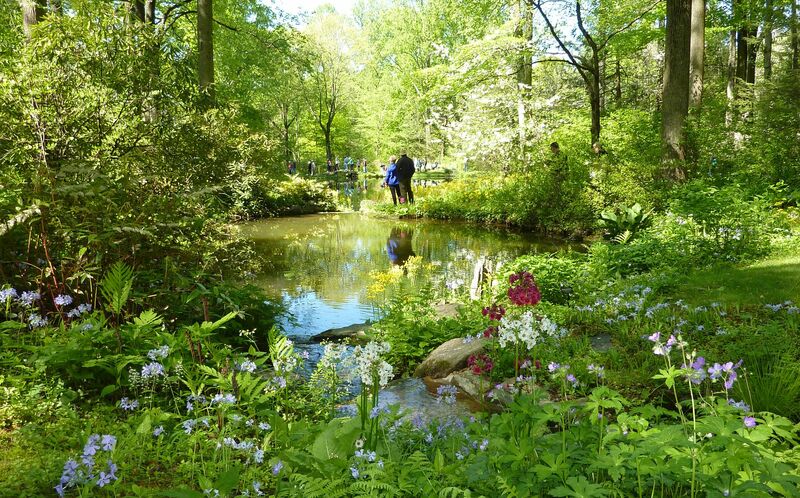 When first entering the woodlands, there are patches of Trilliums under the Oak Leaf Hydrangeas, Rhododendrons and other shrubs beneath all the trees. I don't think I was paying that much attention when I took this shot but I like it all the same. 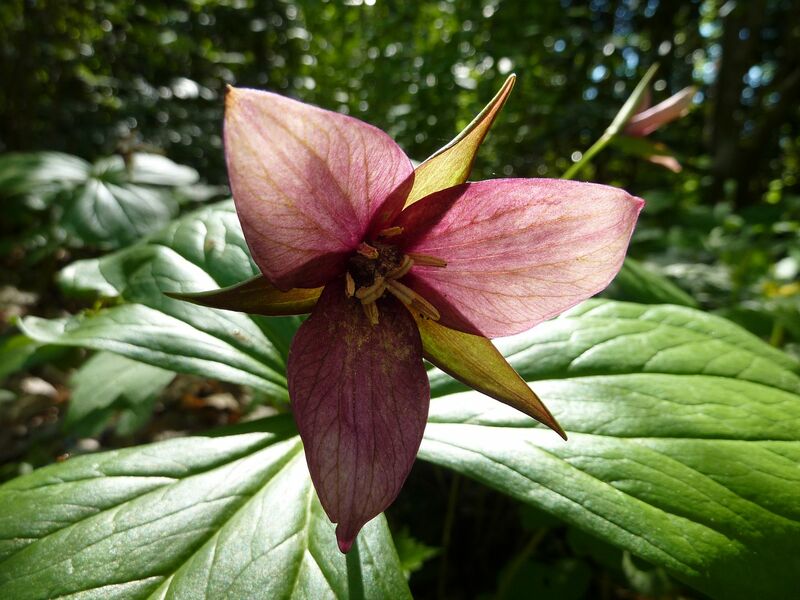 I think they are Trillium simile, one of my favorites. 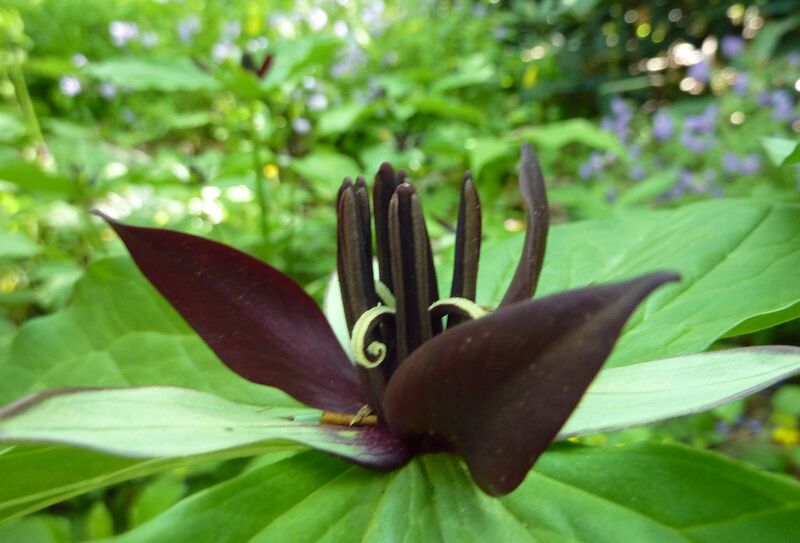 Twisted Trillium, Trillium stamineum, is always one that I look forward to passing in the gardens. I'd love to own a patch someday but for now I guess I'll have to window shop. I love how the petals coil around. They normally open a red color but quickly face to the dark burgundy above. Moving on, patches of Trillium luteum start popping up. 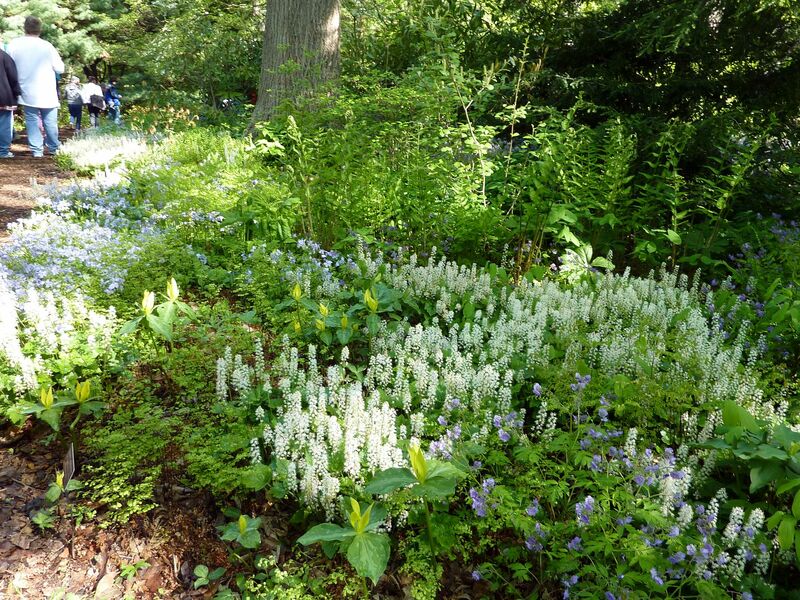 I love the combination of Foam Flower, Tiarella cordifolia, and whatever Phlox this is. 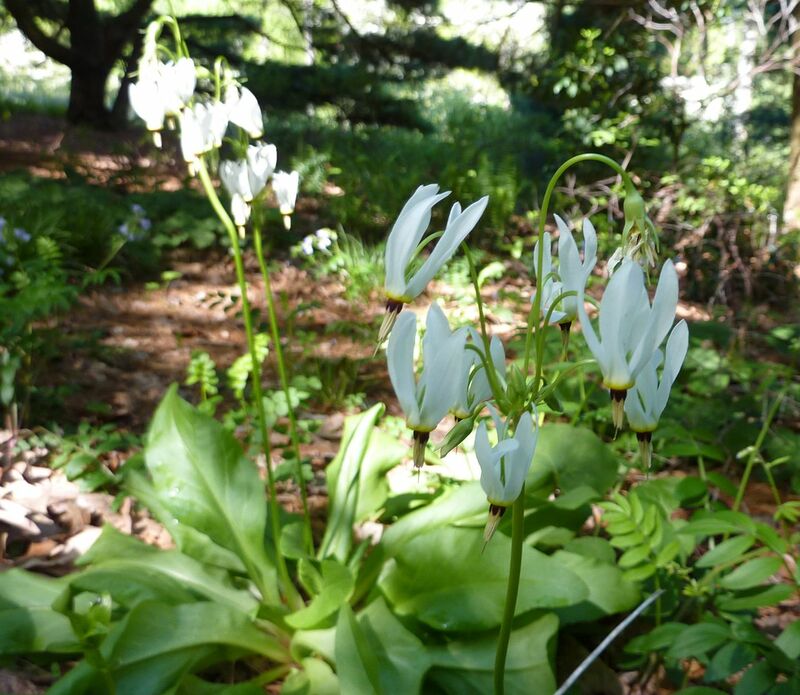 Foam Flowers are a favorite among native plant gardeners. I personally don't use them that much in my garden but I see their appeal. 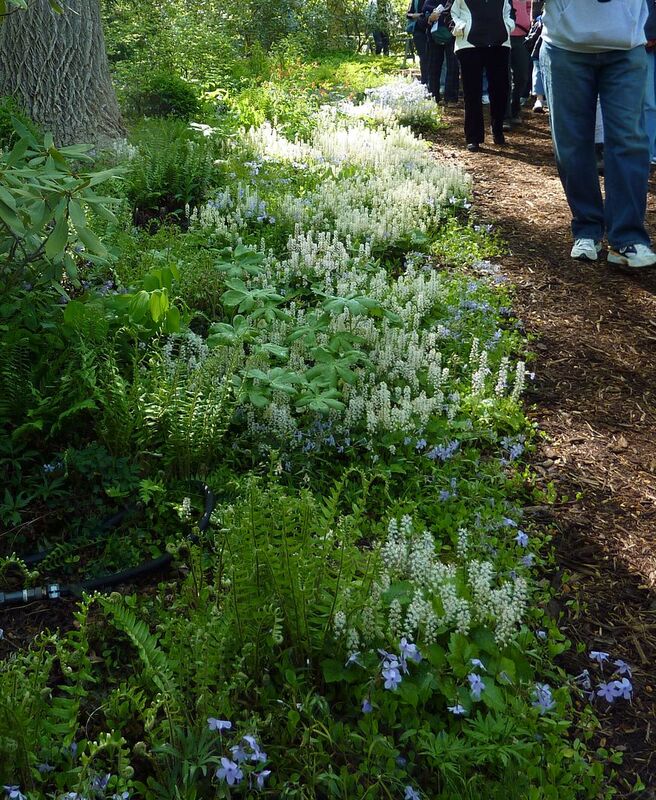 Here they're used as a swaying boarder among Ferns, Phlox, and other plants. Higher up in an area called the Trillium Garden they're used with other species of Trillium. This isn't my favorite combination but I believe the Trillium Garden is a recent addition and work in progress. Because Trilliums take the better half of a decade to flower this is going to be a real show stopper spot in years to come. Right now though it's as impressive as other parts of the garden. Trillium grandiflorum 'Flore Pleno' is a double flowering variety. Every plant here is a clone of itself. 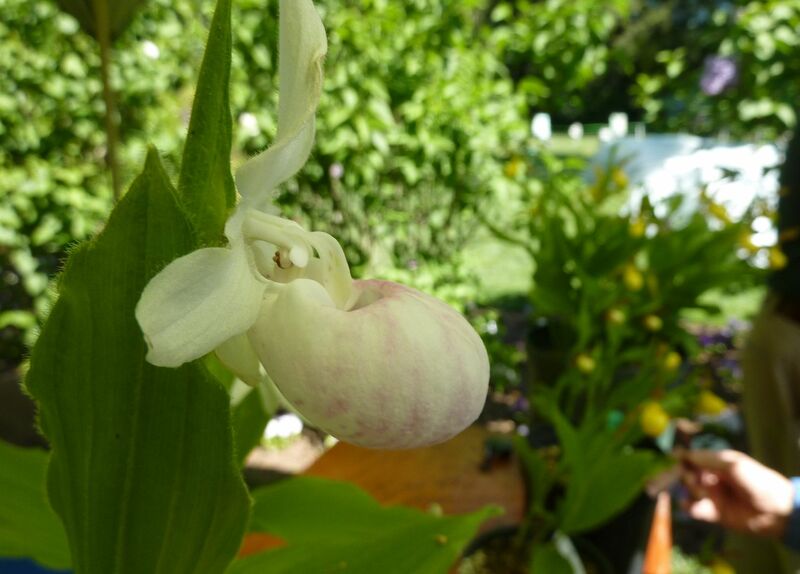 The flower lacks any reproductive structures and is made simply out of habit. 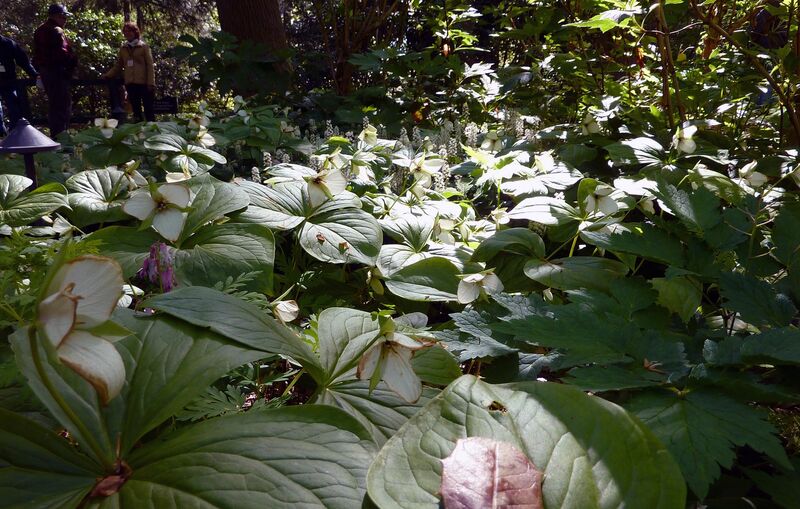 Lots of wildflowers use both sexual reproduction and division as modes of reproduction and Trilliums are no different. After flowering they start to make seeds but while this is going on the rhizome underground is expanding in all sorts of directions, until it divides. This may take several years to achieve. This is also the first image I'll point out that shows off a style of photography I like. I'm not sure if it has a particular name, it's just a way I like to compose a shot. I was once told I have an eye for photography by a women who teaches camera work. Here we have the flower looking at you dead on, but also others to show what it looks like form side angles as well as a nice clump of them in the back. Instead of taking 3 separate shots I like to get it all in one. 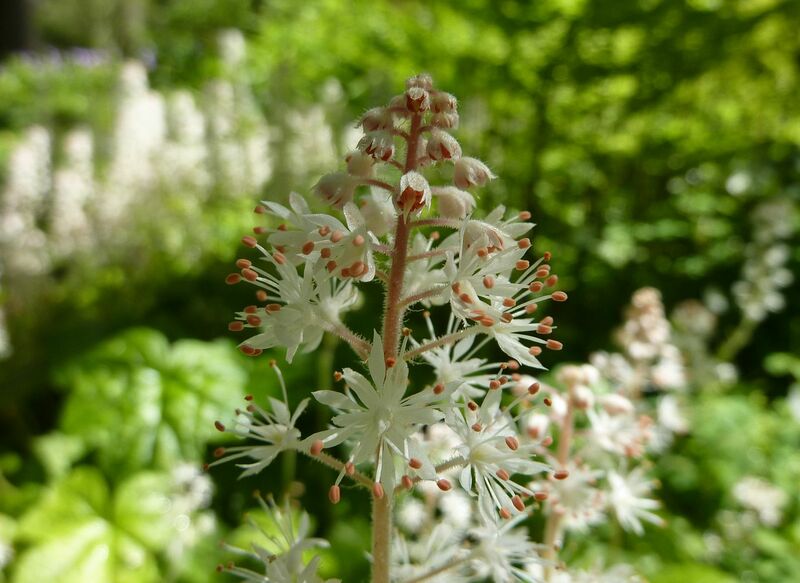 Here's a similar composition with the Foam Flower, Tiarella cordiflolia. Though to be fair it's hard not taking a shot as described above with this plant. 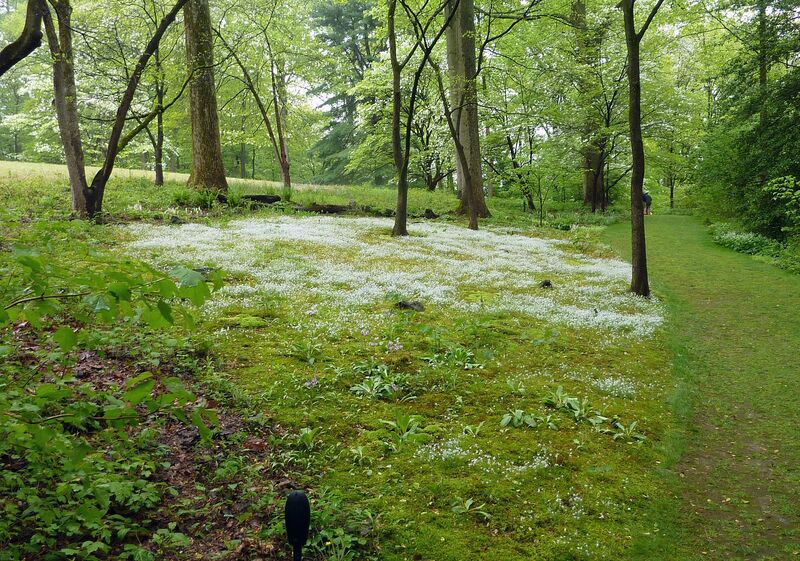 Each clump sends up dozens of flowering stems. This isn't a plant that I study at all. There are only two species in the genus, with T. cordiflolia being the eastern most one. 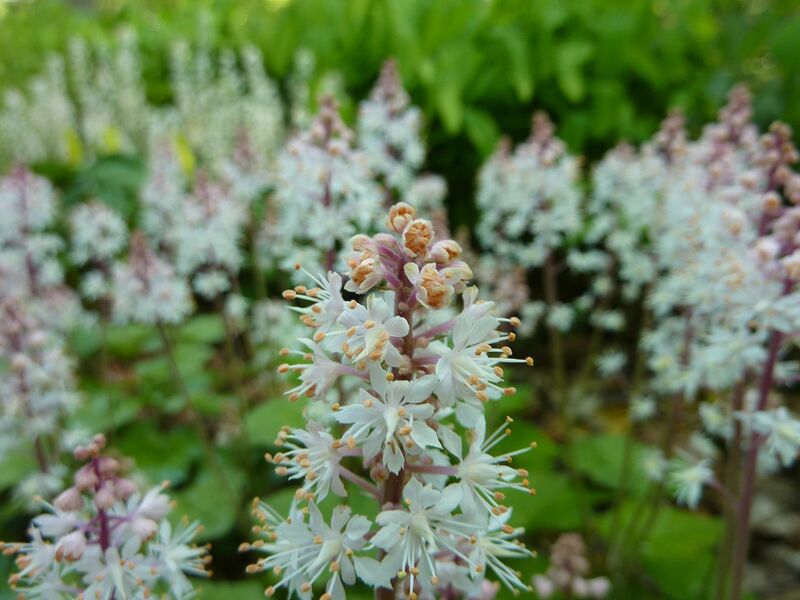 It comes in three varieties, has several named cultivars, and even hybridizes with a related genus Heuchera. 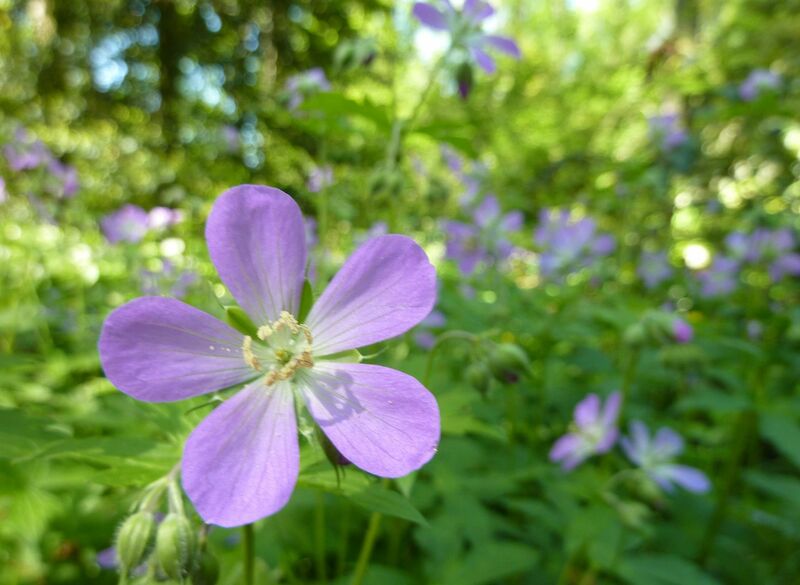 Geranium maculatum, is a native Geranium. It's also a hardy perennial unlike the mass produced ones typically sold at nurseries. 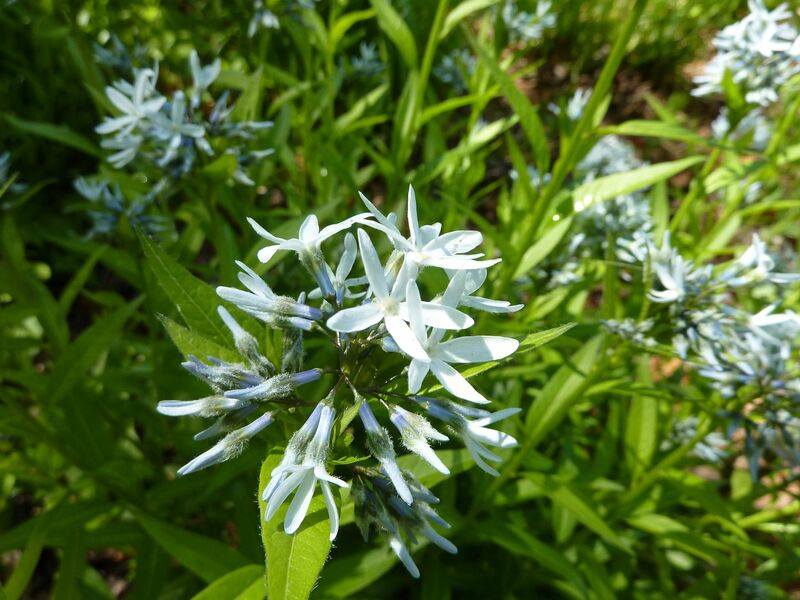 Amsonia tabernaemontana, Eastern Bluestar, was actually labeled as Dwarf Dogbane. I've never herd it called that before. I have some of these in my yard and they were a passing hit with the recent butterfly migration. Red Admirals, Painted Ladies, American Ladies, and Eastern Commas and Question Marks all zipping by at light speed. It's amazing how they seem to fly faster than most birds. 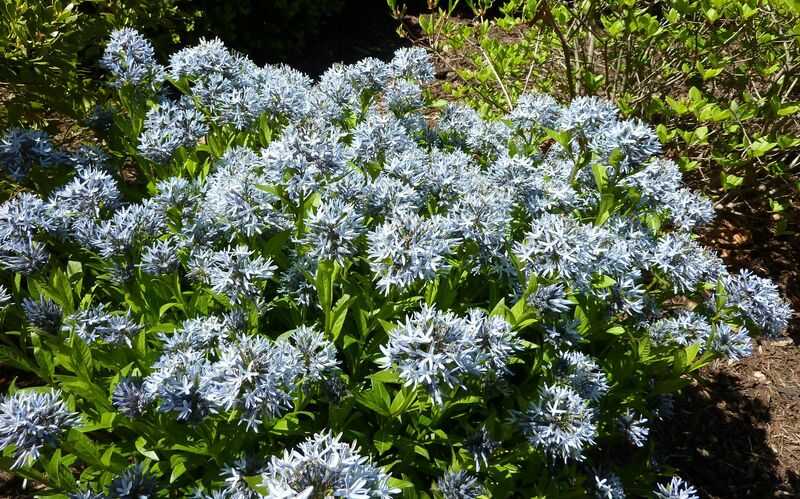 Blue Stars are one of those plants that really aren't planted enough. Even after being named Perennial of the year in 2011 I have yet to see any effort to make this plant more widely available. 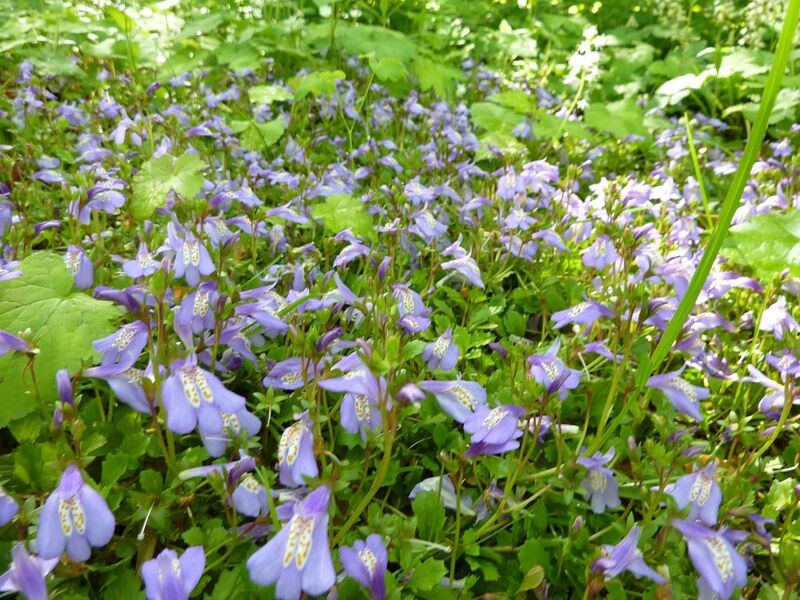 And that's a shame becuase so few plant can boast this many blue flowers in full sun conditions. Amsonia hubrichtii has wonderful pine-like leaves that make the plant look like a cloud one wants to lay on. 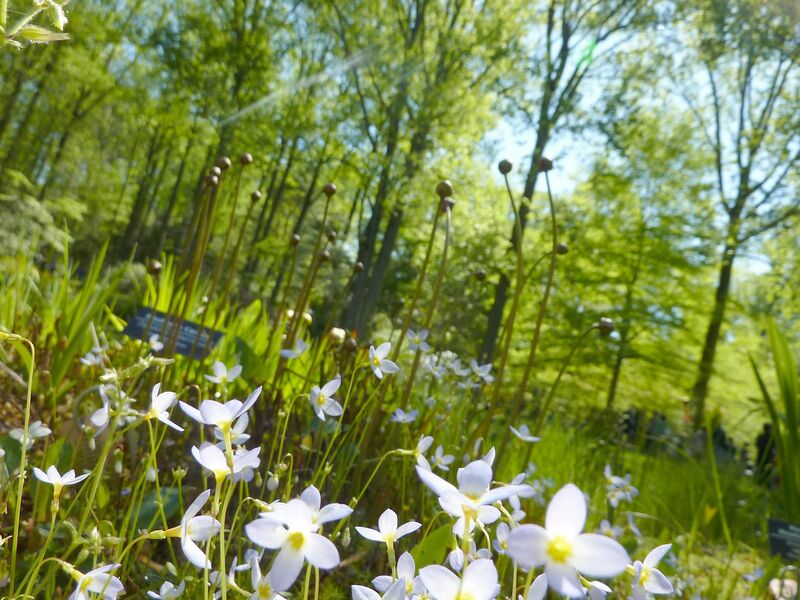 The Meadow Garden is where most of their prairie plants grow. Most of the plants that grow here will do their thing over the summer and fall though. It's a lot bigger than what this shot would lead you to believe and lined with lots of flowering forest edge species. 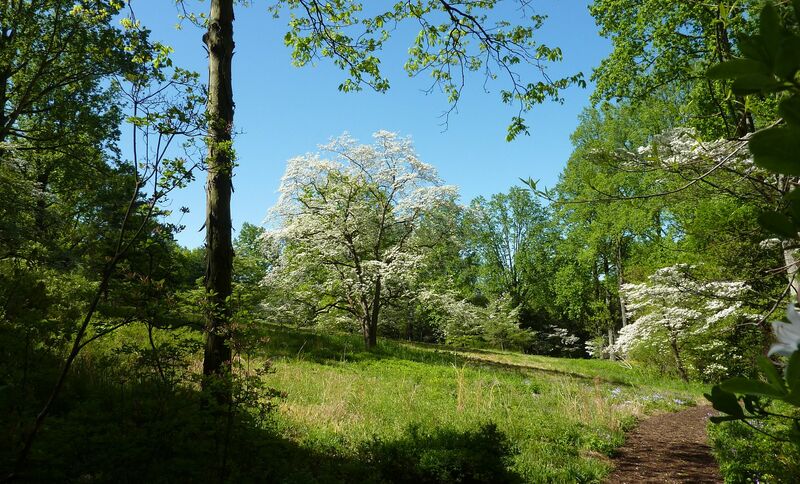 Namely Dogwoods, Buckeyes, an Eastern Redbud or two, the usual fun stuff. Carpets of Dwarf Irises are something I usually walk right past. This year I decided to take it slow and photograph at my leisure. This pale blue one was mixed in among the whites and I think it might be a hybrid but I'm not quite sure. 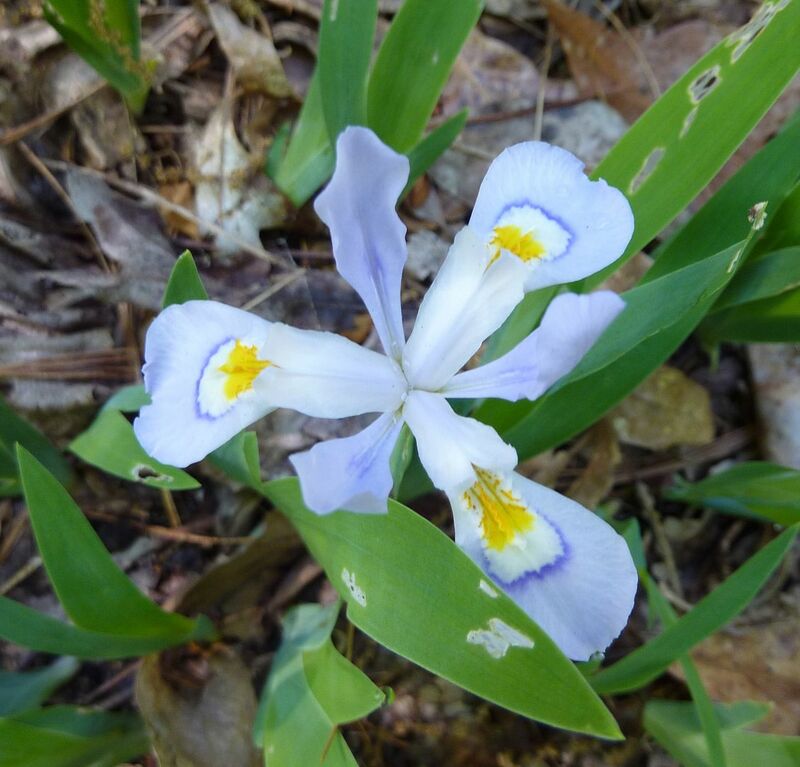 There were Blue Flag Irises around which tend to be dark blue. 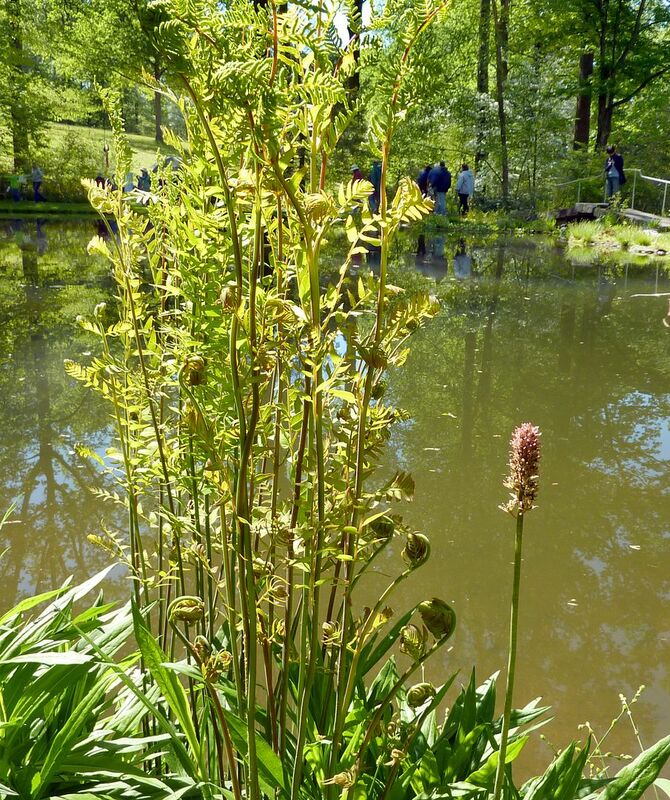 The Pond Garden was bustling with activity. Here a random couple stands out gazing together. It's a really sweet moment I think. 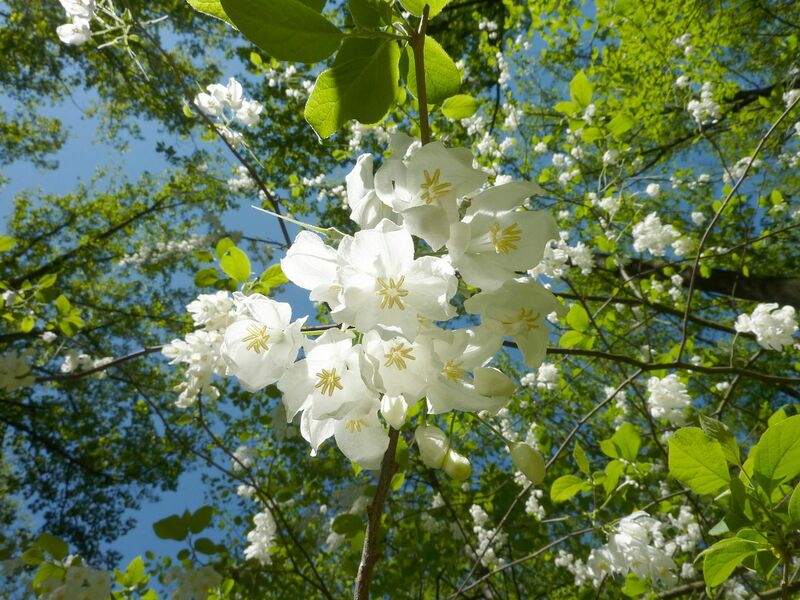 Carolina Silverbell, Halesia tetraptera, is the white flowering tree next to them. 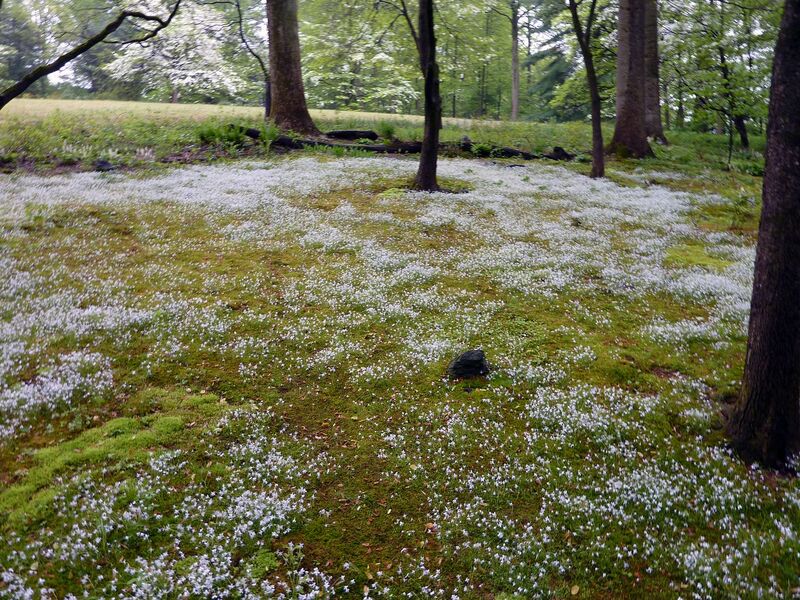 The flowers point down to the ground giving them a bell shape look when viewed from the side. 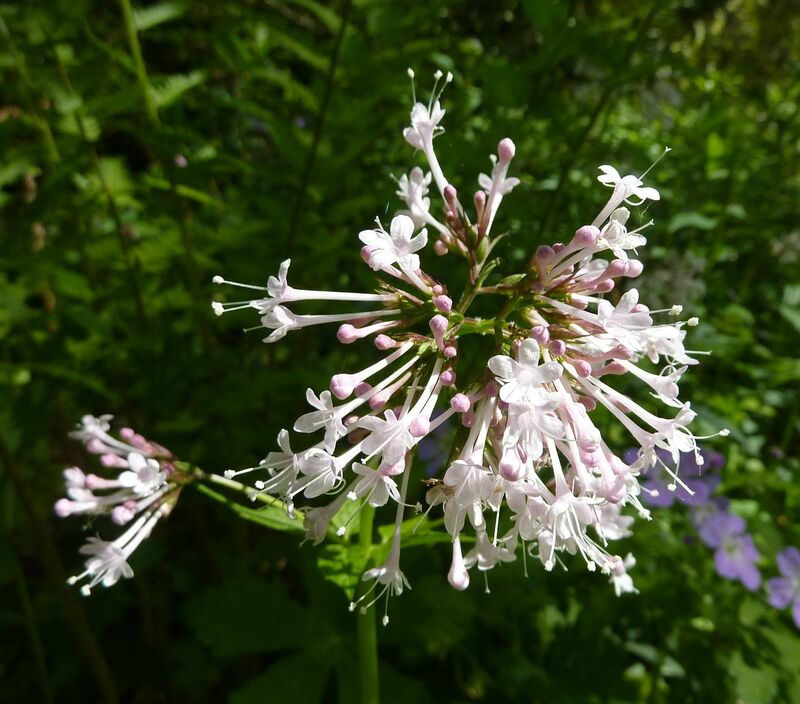 Large-Flowered Valerian, Valeriana pauciflora, is a new native to me, and one I just might have to buy somewhere. 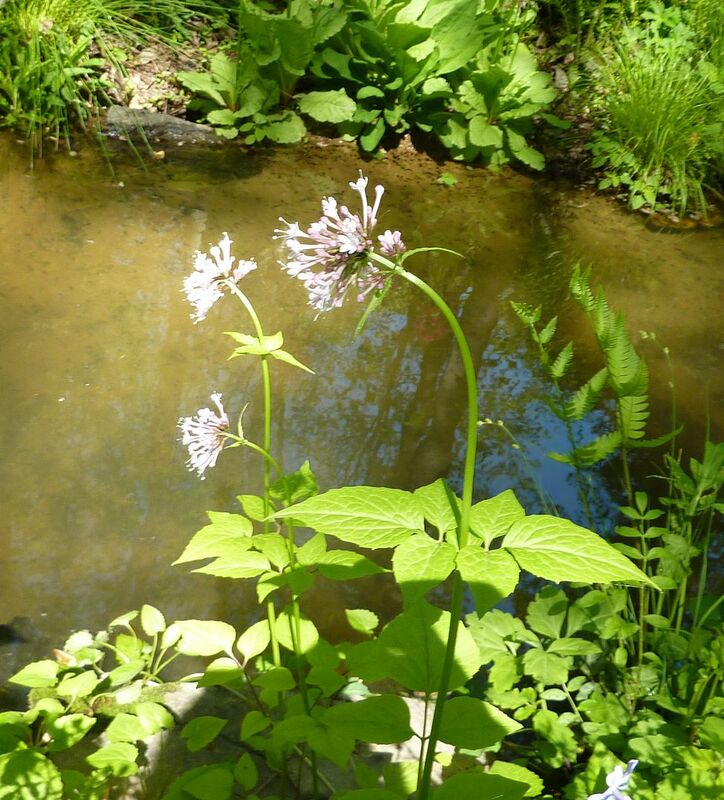 Clumps of this plant lined the pond here and there among other plants. 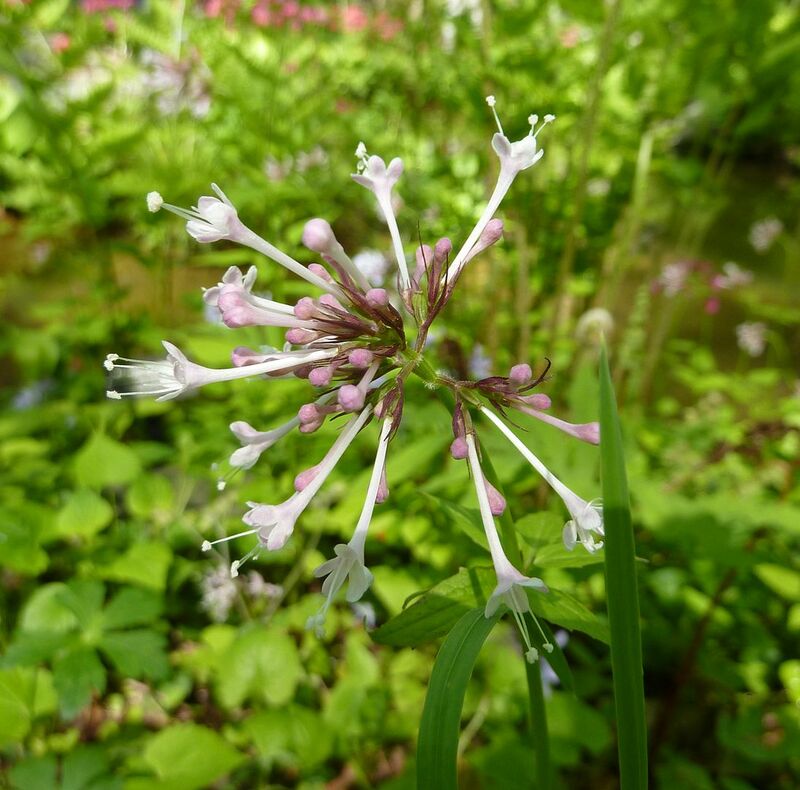 Valeriana pauciflora is of course a native plant. And it look similar to another native. 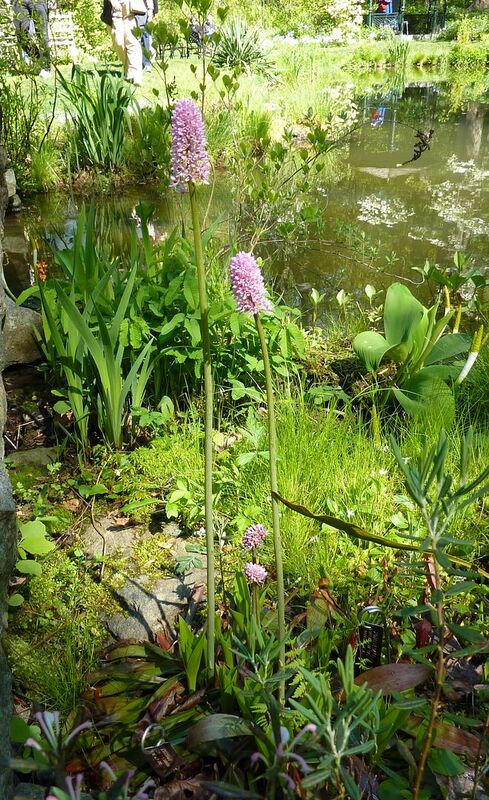 Swamp Pink, Helonias bullata, is a threatened species that grows in wetlands. They have dozens of these plants all along the ponds but most were past their prime. Here a Swamp Pink is growing next to a massive Fern that was almost as tall as I was. I like this shot because it plays with proportions. ... okay I have no idea what this was but it looks like something in the mint family. It was very low growing and they had a clump of it here and there. Woodland Stone Crop, Sedum ternatum, is one plant that I found myself almost stepping on. They used this as a boarder where it grew low to the ground. 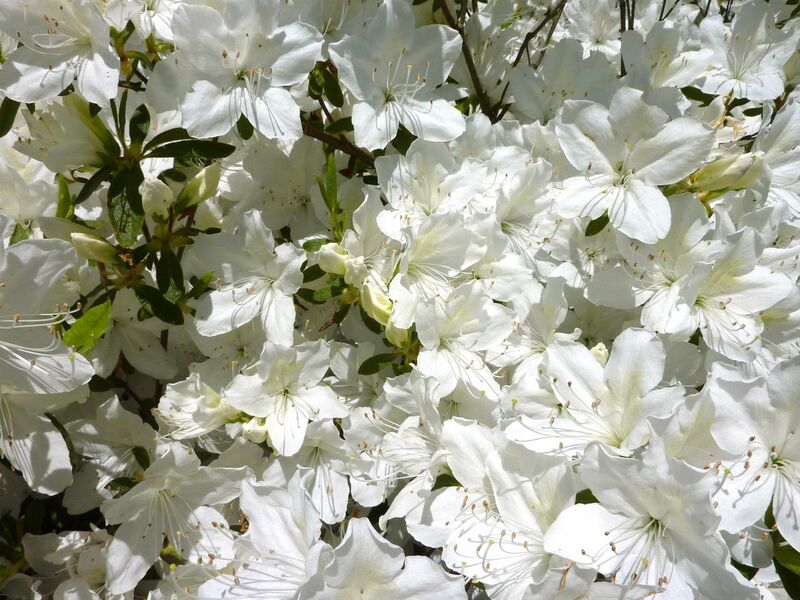 The white flowers were angelic in full sun, almost glowing in a blaring sort of way. 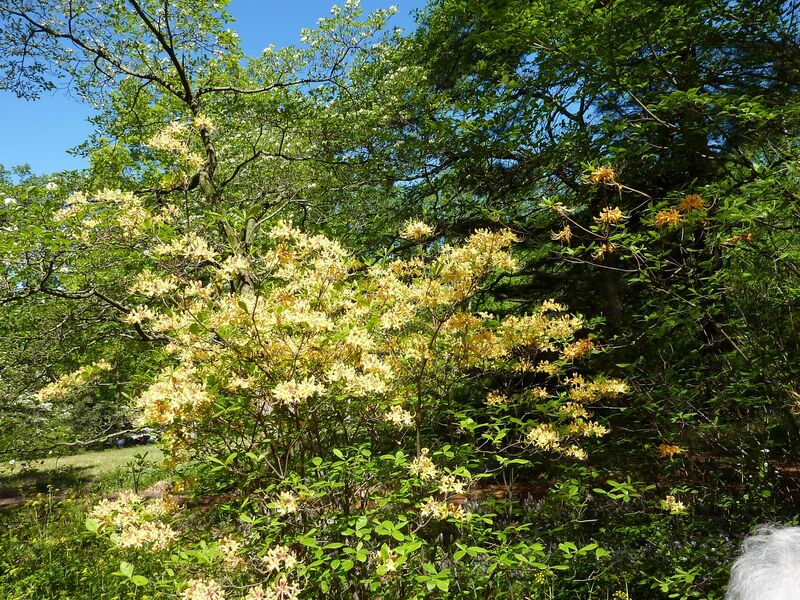 The foliage itself, despite being green in the photo is very shiny and reflects white very well. It's a plant that's easy to walk right past. Another play with composition. 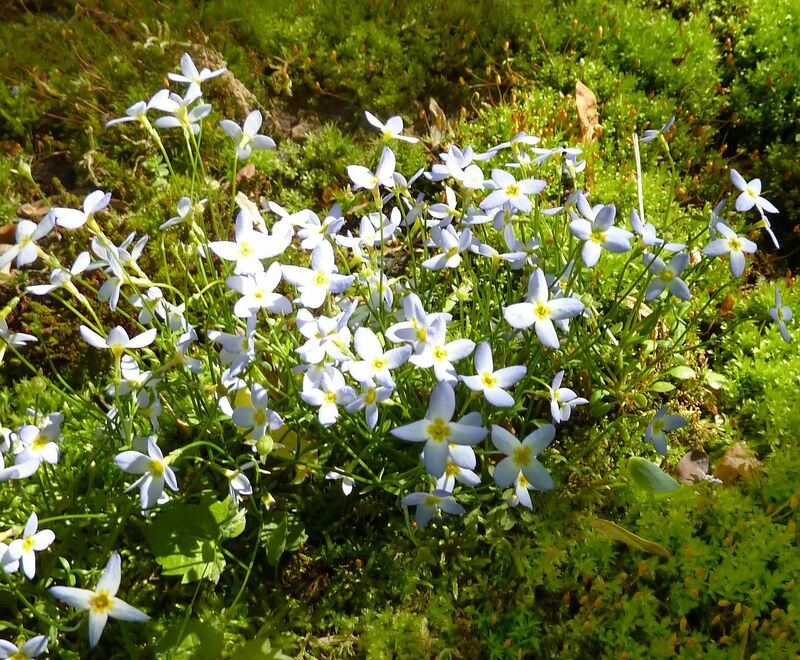 In the foreground tiny Bluets, Houstonia caerulea, show off their tiny blooms. Behind them the flowers stems to pitcher plants, Sarracenia sp., poke upward ready to bloom. And in the background lies the forest towering above. The Mt. Cuba Center is the first place I ever saw Bluets. My first tour around I don't think I even noticed any except for the big patch they have. I think they're transplanting them from the patch to other spots in the gardens. Which is nice to spread the wealth. I tried planting them one year and while they survived the winter, they did not survive the next summer. Growing them in Moss or near water where there can put up with competition seems vital and I see that being the case the gardens there. 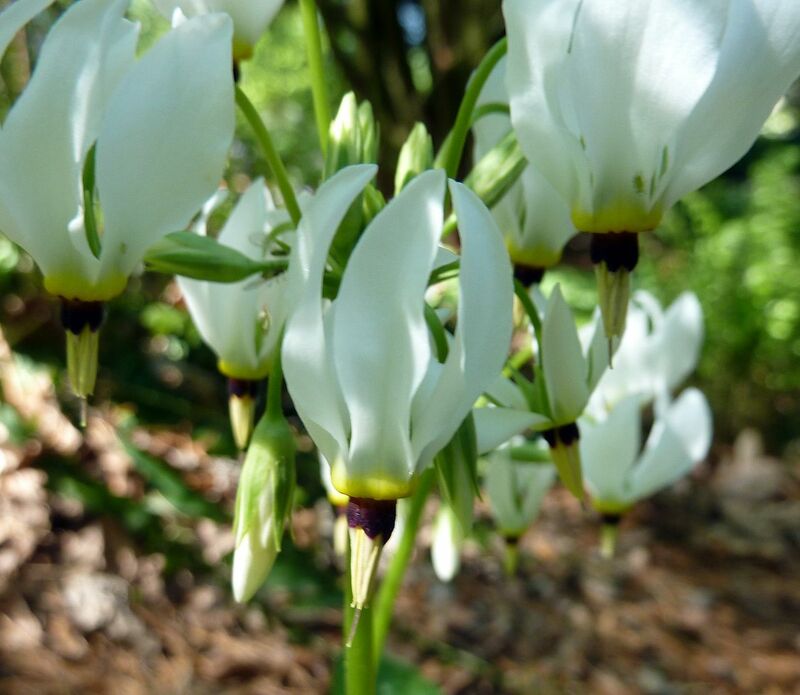 Shooting Star, aka Pride of Ohio, Dodecatheon meadia, were flowering very well this year. I saw more than I did last year anyhow. The flowers are like those of a Tomato or Cranberry, and require Buzz Pollination in order to be pollinated. That's when the bee lands on the flower and vibrates it's wings as a certain frequency to shake out more pollen and nectar. I have a few in my own garden but they got planted late and will be flowering earlier than normal. 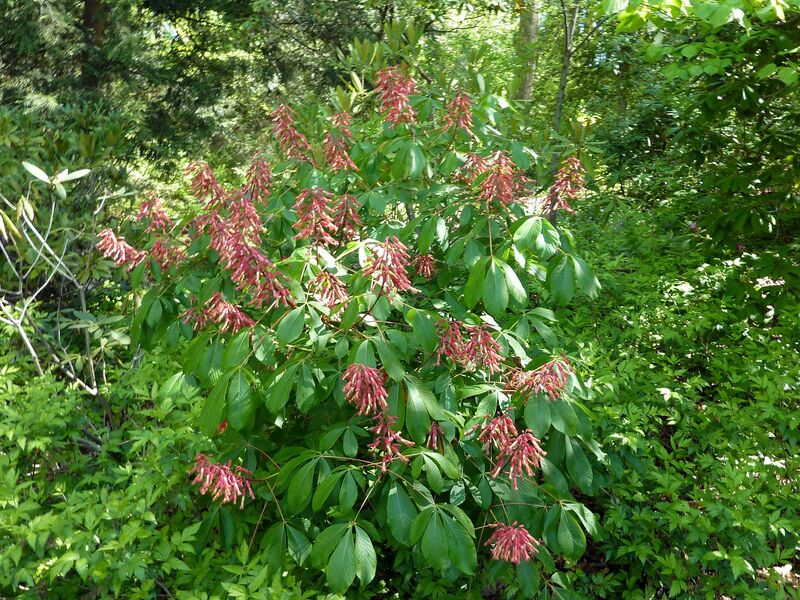 Red Buckeye, Aesculus pavia. This is a tree but plants will start flowering very early in their life. Ones that were only knee high had flowers on them. 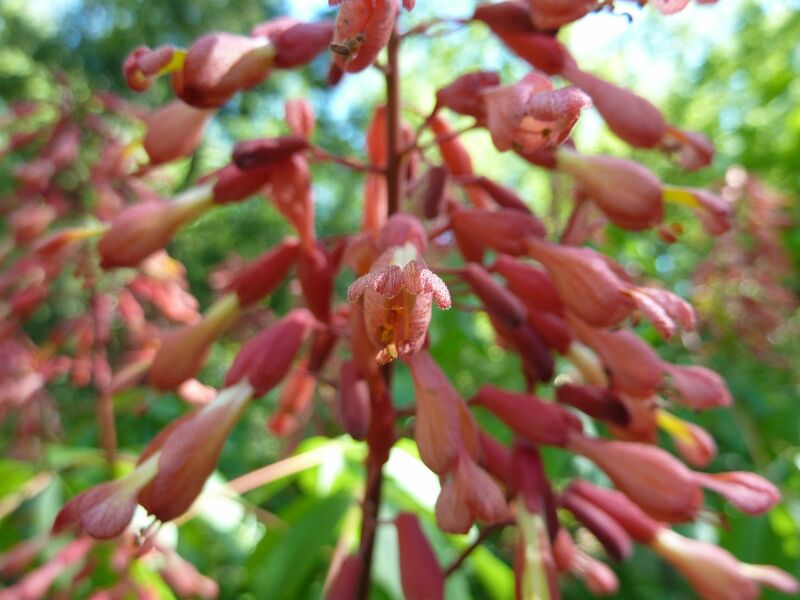 They're pollinated by hummingbirds and long tonged butterflies. Both of which aren't very common at this time of year but there's enough to pollinate them all the same. 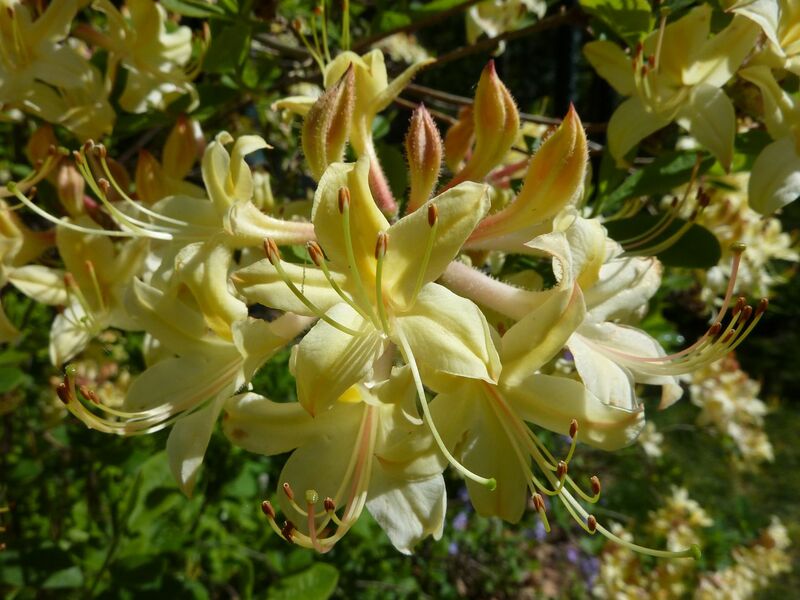 Aesculus parviflora, is a white flowering full sun counterpart. 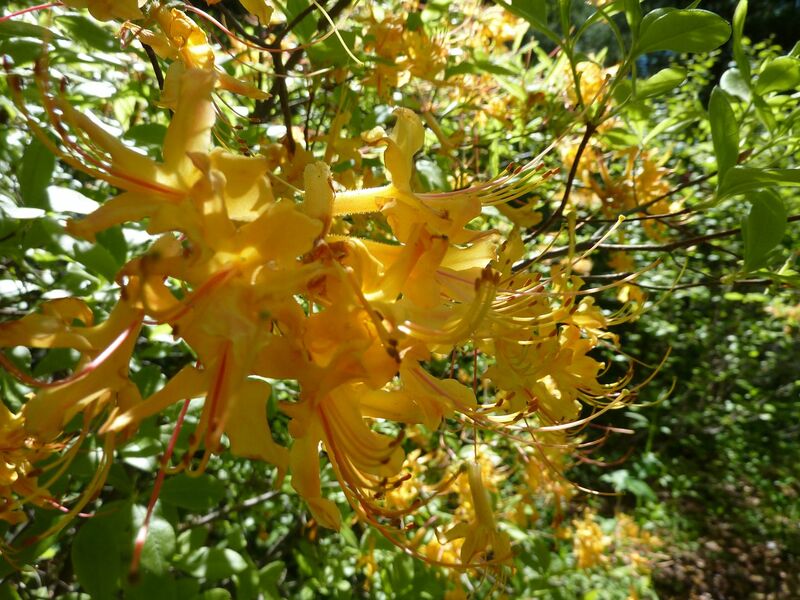 They flower over the summertime when hummingbirds and especially butterfly populations peak. 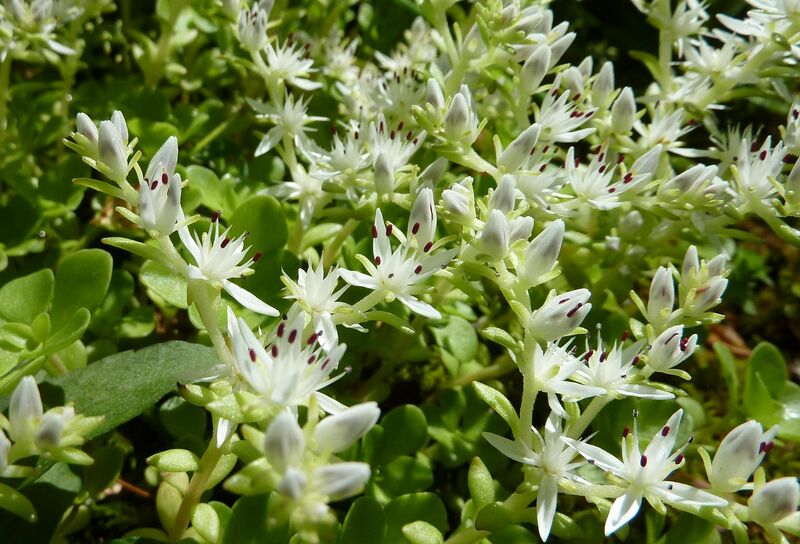 They're an excellent shrub that few growers sell. The only downsides are the plant likes to spread by root suckers, and that the nuts they make aren't edible (might be toxic too) so don't eat them! A display of Orchids ended the man garden tours. These were all flowering all through the gardens but non of my images really turned out well. 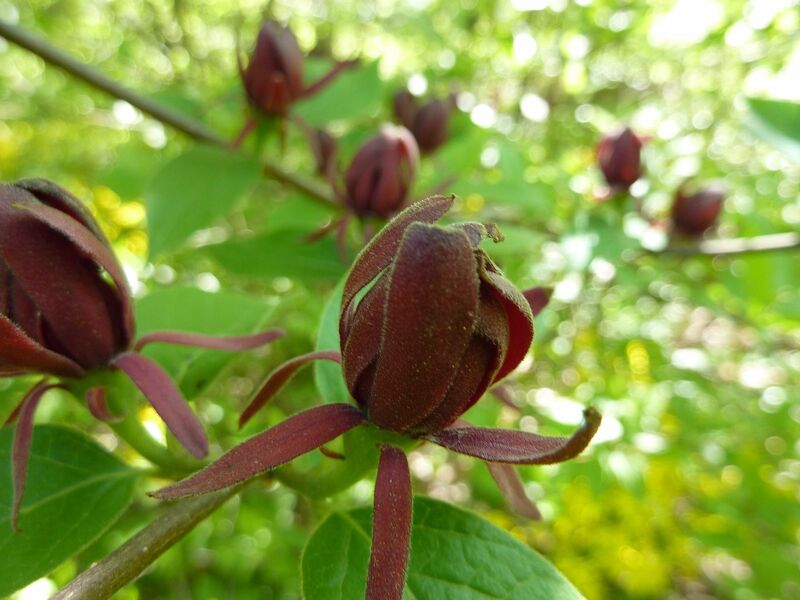 Eastern Sweet Shrub, Calycanthus floridus, were blooming. And that really shows just how far ahead everything is this year. 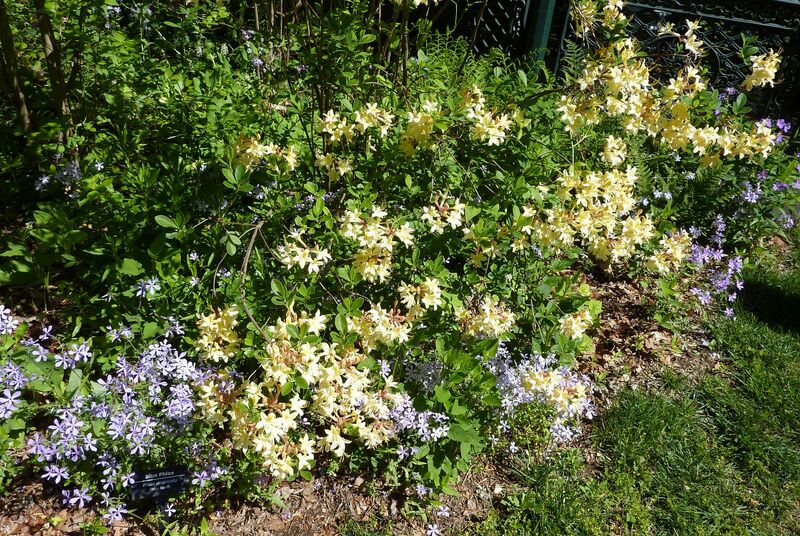 This is normally a summer blooming shrub! May should have been the earliest that this bloomed, and we're talking the southern part of Florida. Rhododendrons were overwhelming this year. 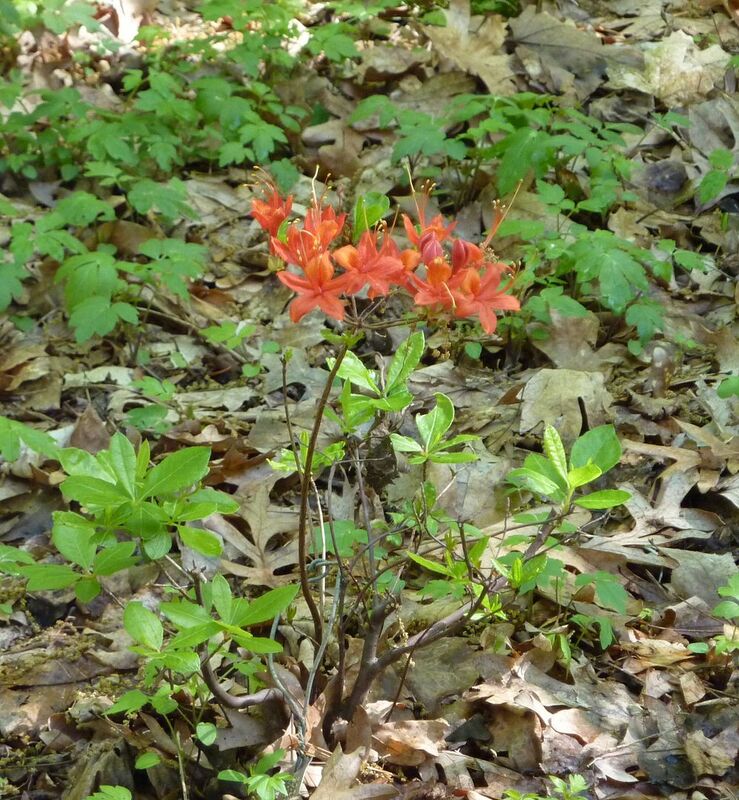 Though the majority of them were the subgroup Azalea (5 anthers, instead of 10). 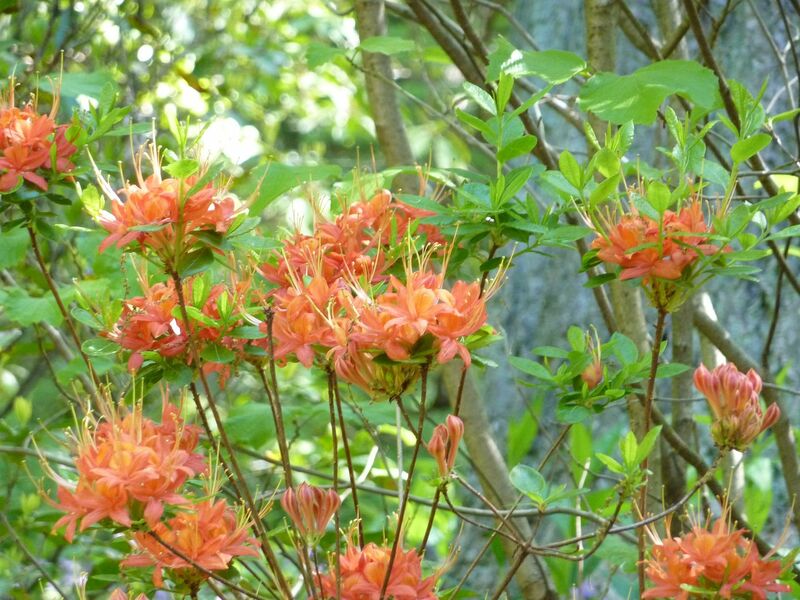 Flame Azaleas were particularly showy this year. 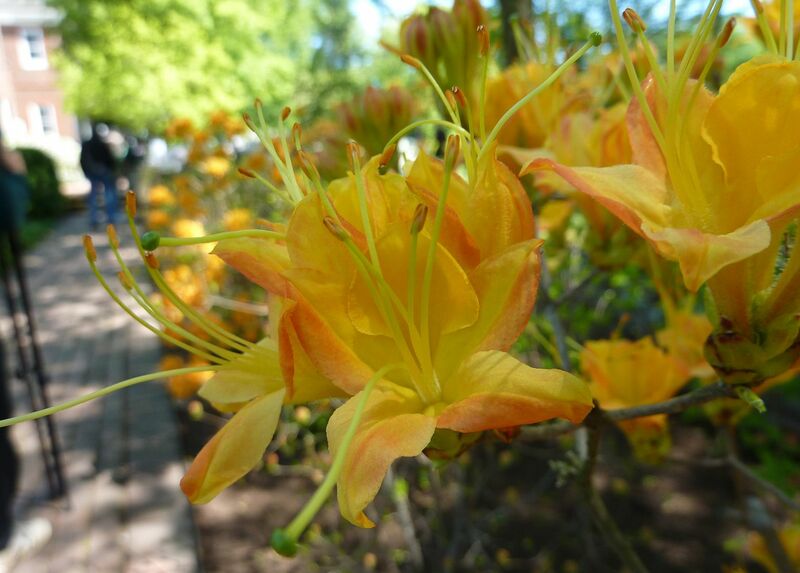 They're fragrant, and come in a variety of hot colors. Orange is the most common, with yellow, and red at both extremes. Here's a yellow one blooming. Not a Flame Azalea but pretty all the same. 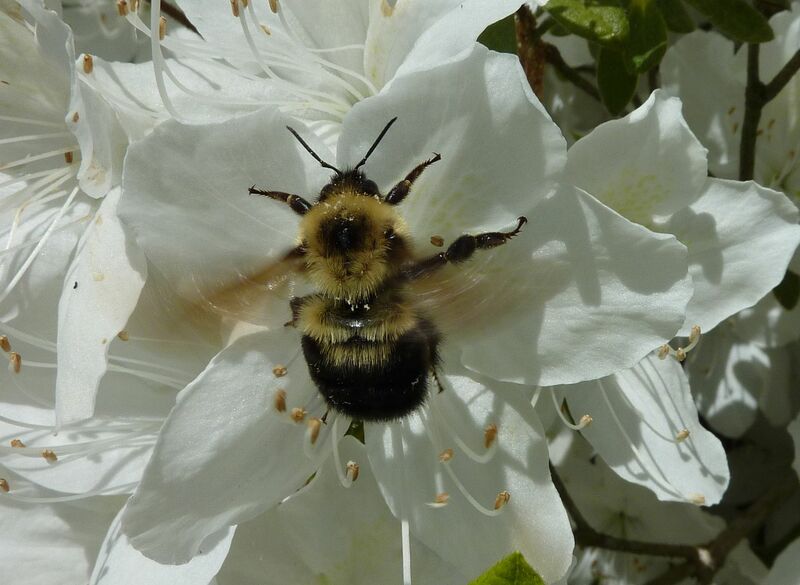 A queen bumblebee and even some workers were out pollinating them. One of the last stops is the Trial Garden. Here they do testing on all sorts of plants to see how good they hold up. 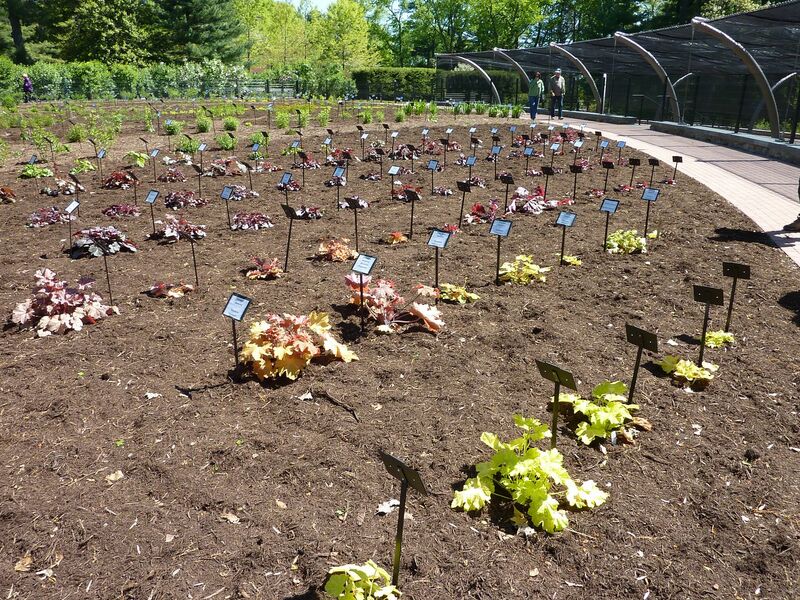 The current test you're looking at has to do with the flood of new Heuchera species entering the market. Breeders of these plants have gotten a rainbow of colors out of the leaves which is why gardeners love them. 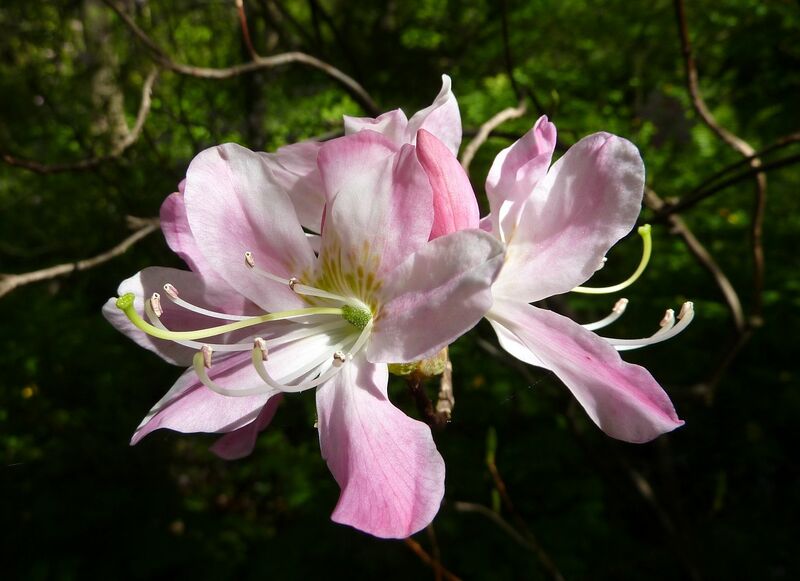 Often though this comes at a price, and some cultivars don't do as well as others. I'm looking forward to the results. There was a butterfly parade event for the children but I didn't stay around for that. 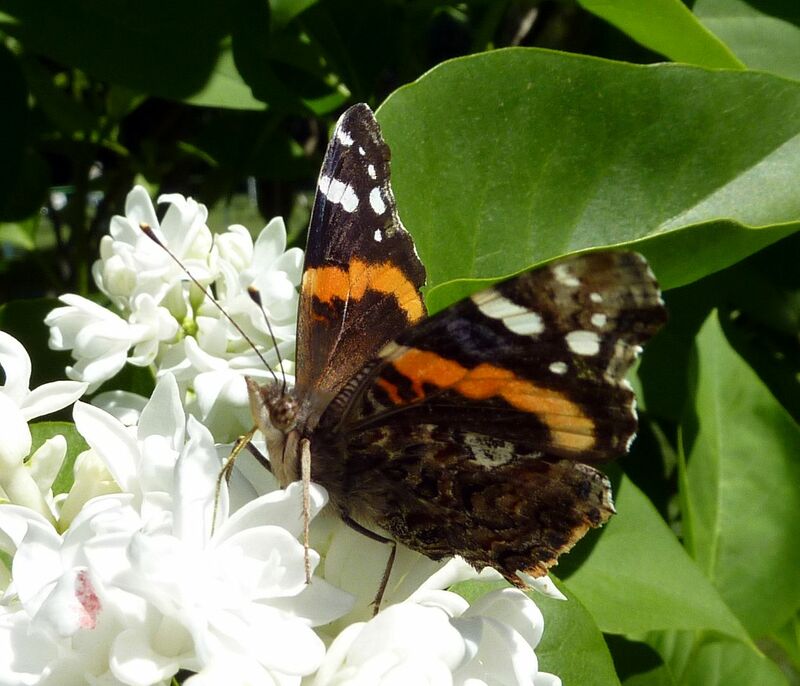 So here's an image of a Red Admiral on one of their Lilac shrubs. 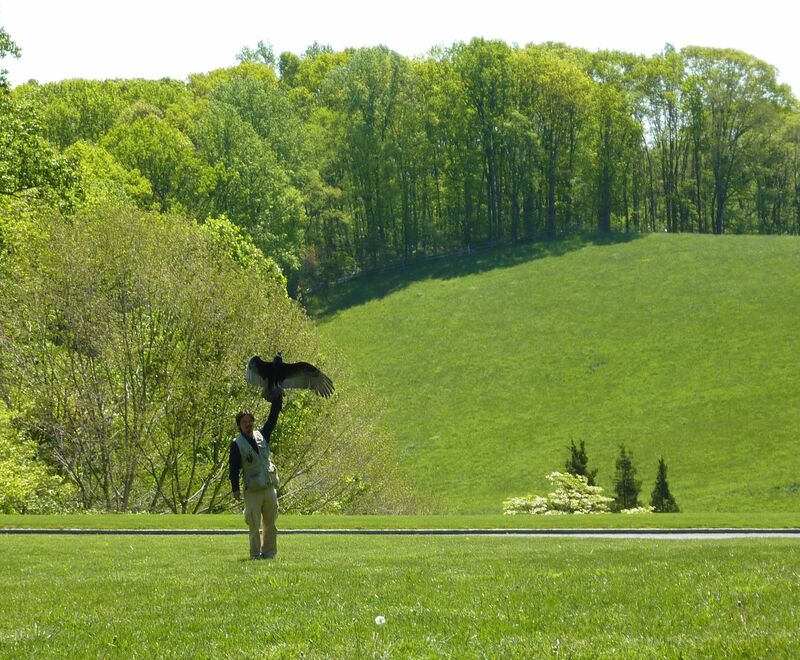 There was also a Raptor Bird Demonstration. I think this was the Peregrine Falcon. They showed us three birds for the one I was at. There was a second in the afternoon I didn't stick around for. 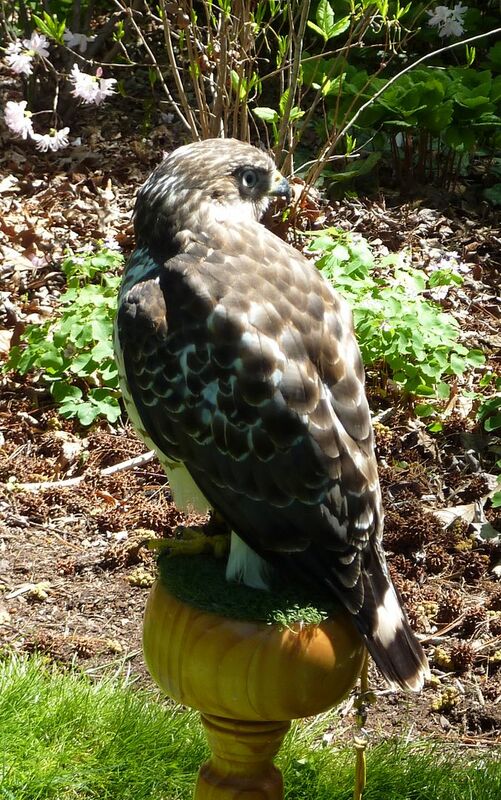 They were a Red Tailed Hawk, Peregrine Falcon, and Turkey Vulture. 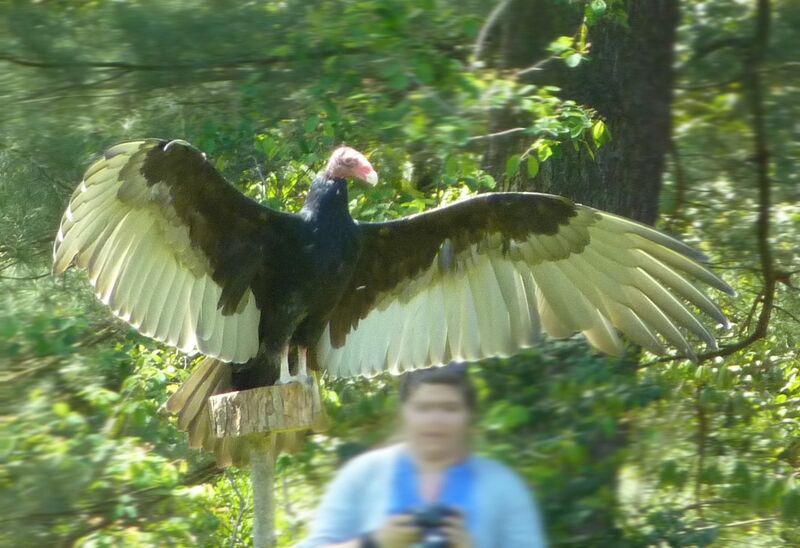 The Turkey Vulture was neat because of how big it was. It was also the only one they had flying around. 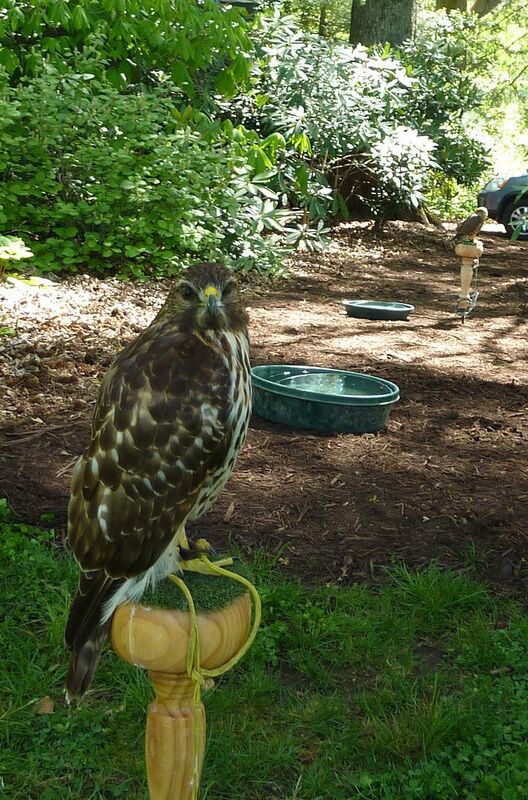 These were all rehab birds so some weren't as aerodynamic as others. Turkey Vultures apparently fly 8 inches off the ground. 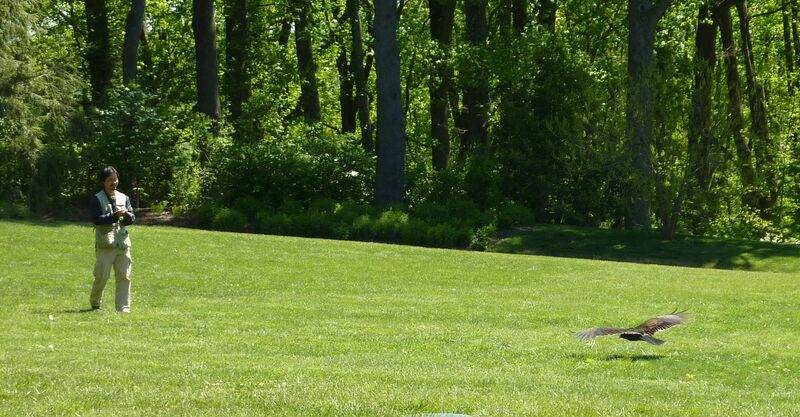 I felt like a sprinkler head could have easily emerged from the lawn and clocked it in the head. They had this bird flying over the audience once or twice and it was only a few inches above my head when it went by. All and all this was a great way to end the day. And I hope they have it again next year. I ended my trip by driving just down the road to a Native Plant Sale where I obtained 2 more Purple Milkweeds and a somewhat rare Franklinia alatamaha. Shortly after this post they released a video that summed up the event. 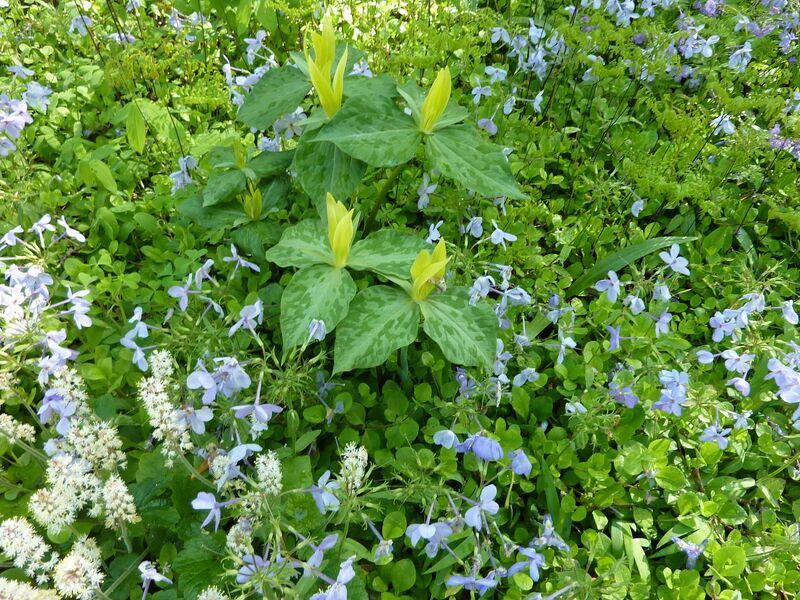 The unknown blue-flowered plant is Mazus reptans, a popular exotic groundcover from the Himalayan foothills. 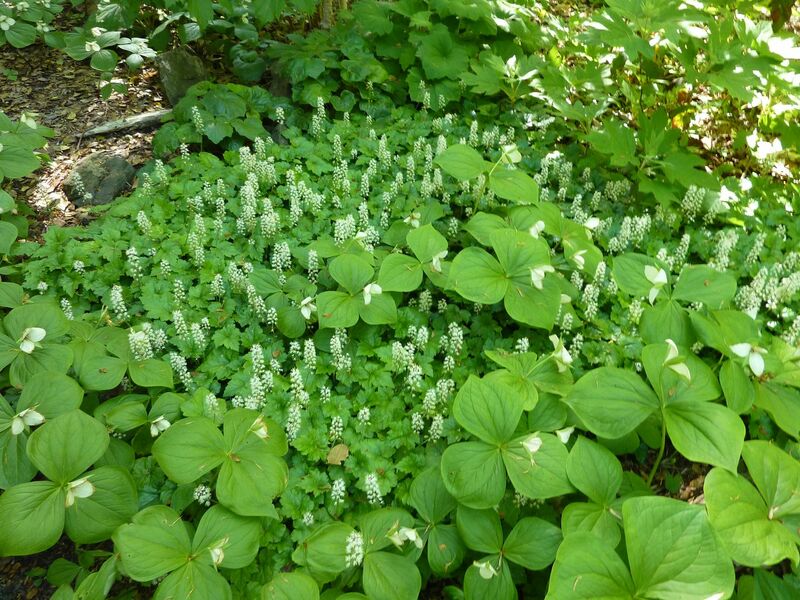 It's not generally considered a weed or an invasive species.